Today, Microsoft has posted more details about upcoming Microsoft Edge features in Windows 10 Creators update. The new update for Edge will include new tab management features, Embracing 3D, Books come to the browser and more are coming. check out the full list below. New tab management features: With new tab management features, users can preview visual thumbnails of all their open tabs at a glance, and set a group of tabs aside in an instant to get a fresh start, removing any distractions and providing a clean browser feel, while remaining confident that they can pick up right where they left off. Embracing 3D: A small but growing number of websites are offering virtual reality experiences that let users view and interact with virtual worlds firsthand. Microsoft Edge will enable support for WebVR so users can experience virtual reality via the web using VR devices and upcoming Windows Mixed Reality hardware. Books come to the browser: Microsoft has designed the browser with tools built specifically to improve the reading experience on Windows 10 devices, with features that not only enable you to read content but also to customize and create your own experience with custom font sizes, layouts, themes, navigation control, Cortana integration and more. Online shopping gets even easier: With Windows 10 Creators update, Microsoft Edge will allow users to have the option to checkout quickly using their payment information stored securely in Microsoft Wallet so they don’t have to navigate through traditional checkout flows and repeatedly enter the same payment and shipping address information. Continued expansion of extension platform Extension developers now has access to over 30% more APIs than our initial release, including access to favorites, roaming data between PCs, and the ability to securely communicate with other installed applications. According to Microsoft, the company will continue to work closely with partners to help them release extensions. 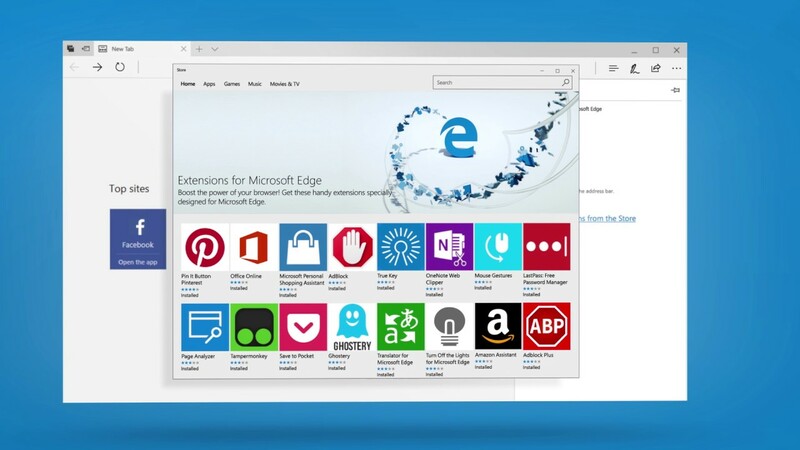 Microsoft Edge Extensions collection is growing in the Windows Store in the past months, such as Ebates, Intel TrueKey, Read & Write, Ghostery, and RoboForm, with many, are coming. Faster, safer, and more efficient than ever: In the Windows 10 Creators Update, Microsoft Edge will be even faster and more responsive on your favorite sites, will get even more out of your battery than today’s industry-leading efficiency, and will introduce powerful new defenses to keep you safe on the web. The new Edge features will be release with Creators Update in April 2017. Check out what’s new is coming with Windows 10 Creators Update here.